When talking to folks about my family’s decision to opt our children out of standardized testing (UPDATE #1: we must now “refuse” testing, as there is no “opt out” option in the state of NH) I find myself answering the same ten questions about the tests, my parenting philosophy, the Common Core State Standards, and the entire school reform movement. In response to that, I thought I would write a blog post that would give these well-meaning and (largely) delightful people a handy-dandy guide to our decision. Enjoy–and please feel free to add your own questions or comments below! 1. Why do you want to opt your children out of refuse standardized testing for your children? We can find no evidence that these kinds of assessments serve any learning objective at all (for students or for teachers)– and in fact, serve to steer students away from actual educational experiences. We believe that in doing so–and in speaking out about it–we can potentially be a voice for those families and students who might not feel they have one…or are afraid to use it. 2. But aren’t public schools, by law, supposed to administer these tests? **UPDATE #2: As part of an attempt to reduce the amount of standardized testing that is administered to students across the state in grades 3-11, NH districts will soon have the option of participating in a “responsibility” (not “accountability”) system of performance assessments called PACE. Before you get all googly-eyed, see here and here for my thoughts about and experiences with PACE thus far. 3. Aren’t schools penalized for allowing students to opt out of refuse these tests? Only in the vague sense that students who do not participate in the state-wide math and reading assessments due to any of the “other reasons” stated above negatively affects what the state calls “reported participation rates.” Some have told me that schools may be at risk of losing funding such as that provided by Title 1. But the second part of my answer to this question includes the phrases “not my problem” and “maybe we should take a cold, hard look at this ridiculous accountability system, then, don’tcha think?” Is it, in any way, appropriate that states (and by association, schools, teachers, and students) are essentially held hostage by the Federal government via these mandated assessments? Not in my book. 4. Don’t you think you’re being a little bit of a helicopter parent? I mean, really. Kids need to experience anxiety and stress in order to grow up to become well-adjusted adults, dammit! Hey, c’mon now. One of my favorite pastimes is making fun of helicopter parents. (Kidding.) By opting my children out of refusing standardized assessments, I could make the argument that I think my kids ought to be hovered over less, not more. And I’m not opposed to them experiencing anxiety or stress. Believe me, my kids experience enough anxiety and stress when I force them to clean my bathroom floor with a toothbrush every other Sunday. 5. Does this have anything to do with your objection to the Common Core State Standards? 6. That Common Core math–awful, right? I know not of what you speak. There’s no such thing as “Common Core math.” If you’re referring to the Common Core math standards, well… here, read this. 7. Are you a Republican? 8. Does this mean you’re unhappy with the school your children attend? No. Both of my children attend very child-centered, community-based, civic-minded schools. Relatively speaking, we’re pretty darn lucky. Our decision to opt out refuse testing for our children has nothing to do with our feelings about our local schools, as my first answer should make clear. 9. So you’ve refused to allow your children to participate in standardized testing. What now? 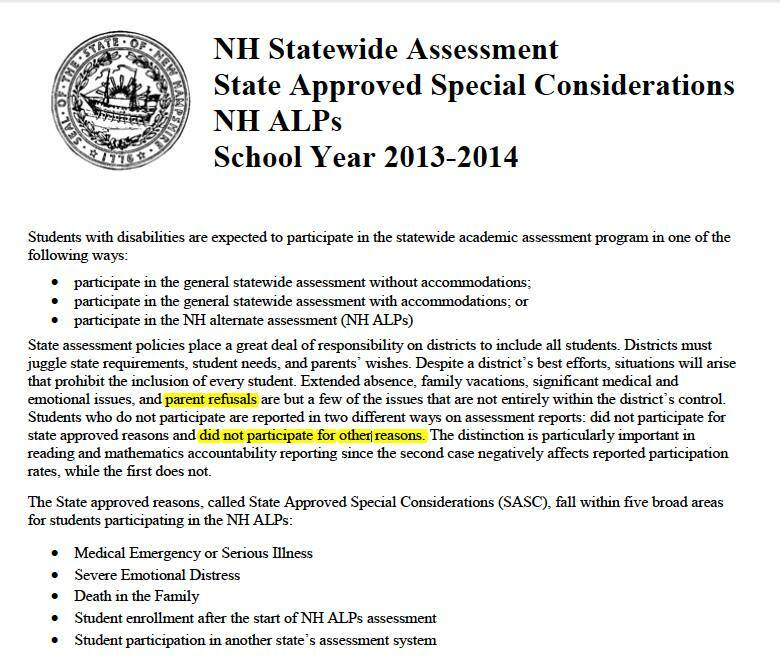 As of April 2014, we did receive written notification that our district acknowledges our refusal of both the state-wide assessments and the equally useless STAR assessment which, for those of you wondering, uses as one of its own selling points (page 34) that it can be used to make high-stakes decisions. However, we are not so naive as to believe that we are entirely “in the clear,” and we sure as heck will not stop fighting for what we believe is right for students, teachers, and the American public school system in general. (UPDATE #3: We were forced to once again argue with members of our district administration about our right to refuse testing in the spring of 2015. We shall see what this year brings.) Not to get all dramatic here, but it’s enormously important to us to demonstrate to our children that in a democracy such as ours, one should never, ever, feel as though they cannot question the status quo or fight for what they believe is right. Unless they object to scrubbing the bathroom floor with a toothbrush. That stuff is non-negotiable, kids. 10. Final Question: What do you think your mentor, Judge Judy, would say about standardized testing? There’s no question in my mind. Next postJoin Me at #UNHLit16 This Summer!